A vision for children's library services in the next decade. 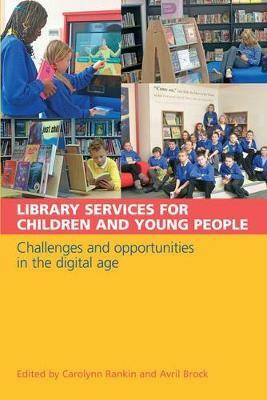 This book provides a sound background to all aspects of library provision for 6-18 year olds. It is designed to support the strategic planning and delivery of library services and programmes at a local community level or in schools. The book outlines a vision for children's library services in the next decade and carves out a strategy for engaging with the challenges and opportunities for children's librarians and policy makers in the Google environment. This book is accessible, informative and inspiring and offers practitioners the knowledge, ideas and confidence to work in partnership with other key professionals in delivering services and programmes. It provides an evidence base, which promotes and encourages the development of effective library services for children and young people. The case studies, scenarios and vignettes, drawn from UK and international sources, show that the key issues have an international dimension, and the similarities and differences in service provision will be of interest to many. In addition to the two editors, chapters are contributed by a range of internationally known practitioners and academics, offering a wide perspective. Case studies at the end of each section complement themes and practices from previous chapters while rooting the discussion in a specific context. The book is organized into four parts: Children's library services - policy, people and partnershipsConnecting and engaging - reaching your audience and catching the latest wave (acknowledging the role of technology)Buildings, design and spaces - libraries for children and young peopleIssues for professional practice. Readership: This book is essential reading for all senior library practitioners, children's librarians and school librarians, subject co-ordinators, and managers in schools. It will also be of value for all postgraduate students on CILIP accredited library and information management courses.